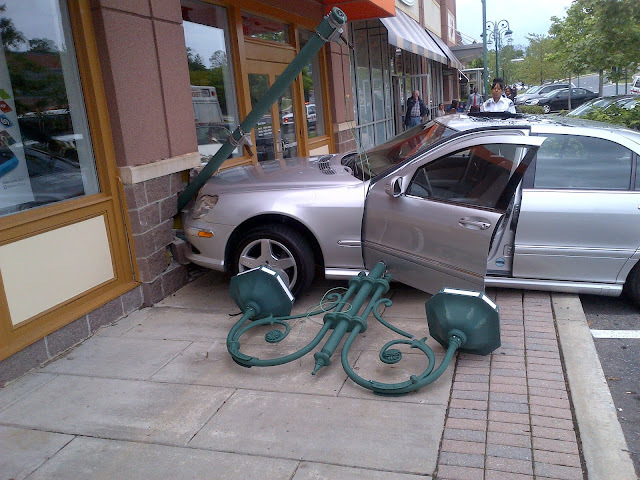 A car damaged the brick facade of a retail store at the Bowie Town Center this afternoon. A Mercedes 4-door sedan drove though a parking space in the 3900 block of Town Center Boulevard around 1:45 pm striking a light pole driving the pole through the front brick facade. The adult female driver was treated on the scene and refused transportation to a nearby hospital for a check-up. The retail store was evacuated of all employees and customers until a building inspector arrives and determines the amount of damage. Fire/EMS units from the Northview Fire/EMS Station and the Departments Technical Rescue Team operated on the scene of this incident. The City of Bowie Police Department is investigating the incident. 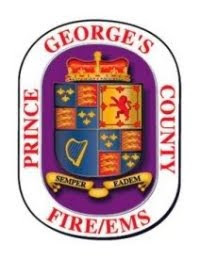 A Fort Washington girl was recently recognized by the Prince George's County Fire/Emergency Medical Services (EMS) Department for her efforts in recognizing and ensuring the reporting of a house fire. Deputy Fire Chief Ben Barksdale presented 12-year-old Jasmine Walker an award at a ceremony held at the Fort Washington Fire/EMS Station on #847 on Fort Washington Road on Friday, May 11. Jasmines family and ffirefighters from the Fifth Battalion joined Deputy Chief Barksdale in recognizing Jasmine for her actions. In presenting her award certificate Barksdale stated, "On April 10, 2012, while traveling with your mom on Livingston Road in Fort Washington, you observed a large amount of smoke and persuaded your mom to check out the source. At the scene, you saw that a fire, which began on the home's exterior, was now starting to extend to the inside and surrounding brush. Your mom called 911, and firefighters soon arrived and extinguished the fire. Your concern for others compelled you to persuade your mom to head in the direction of the smoke. Your actions prevented extensive damage to the home, kept a brush fire from extending into the nearby woods, and demonstrated what the Fire/EMS Departments means by 'If You See Something, Say Something.' Congratulations." Five University of Maryland students need to find a new place to live and study for exams after a fire damaged their College Park rental house. 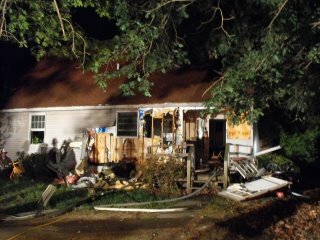 Just after 11:00 pm, Sunday, May 13, firefighters were alerted to a house fire in the 7000 block of Baltimore Avenue. Fire/EMS Units arrived quickly to find a fire in the basement of a 1-1/2 story single family house. The off-campus house is used as a rental that houses five occupants, 4 males and 1 female, that attend the nearby University of Maryland. There was only 1 student home at the time of the fire, he was studying for final exams which start today. It required about 15 minutes for 25 firefighters to extinguish the fire. The cause is believed to be a light fixture on the ceiling of a basement bedroom. There was a small amount of extension to the first floor. Fire loss is estimated at $13,000. One firefighter sustained a sprained ankle while battling the fire; he was treated and released last night from a local hospital. The one student at home was assisted by the County Citizens Services Unit with temporary shelter at a hotel and with other basic need items. The other four occupants had not returned as of early this morning. This College Park house sustained damage after a electrical malfunction in the basement. Five University of Maryland students were displaced.